The manure was high enough to reach their shoulders. 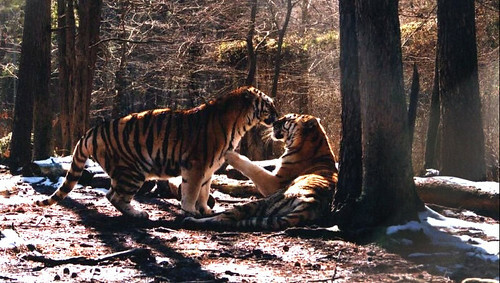 The trailer they were living in was far too small for three full-grown, female Siberian tigers. When they were rescued from their crowded living conditions, they were hungry. They were on edge. These big cats were also very grumpy, understandably so. 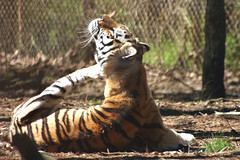 Celebrate International Tiger Day with us on July 29! 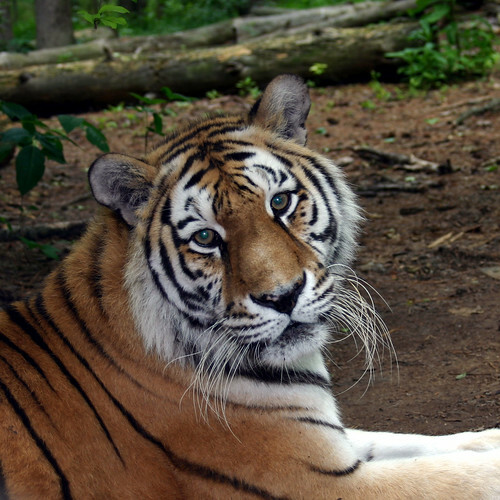 The last Virginia Girl lived at Carolina Tiger Rescue until 2007. When they arrived, they were in poor shape. Manassas and Shiloh Tigers weighed only 180 pounds; the largest tiger of the trio, Antietam, was a scrawny 200 pounds. They ate their way to a healthy 280 and 400 pounds in a few months at the rescue. Tigers can weigh between 300 and 700 pounds. The Virginia Girls, as we came to know them, seemed to enjoy their spacious enclosure. They were playful and even “talked” to their neighboring residents. They remained at our sanctuary until their respective passings in 2003, 2006, and 2007. More than a decade after the last Virginia Girl lived here, there are still many other tigers in need of rescue. In more than four decades, Carolina Tiger Rescue has provided forever homes to 71 animals in need; all of the big cats currently living at the sanctuary were rescued. The wild pet trade is the third-largest illegal trade in the world. Many of our rescued residents come from private owners, roadside zoos, or other facilities because of being abandoned, relinquished, or confiscated. Before accepting a new animal, there are several considerations we take. We must have a home ready for the animals and promise that they will live with us for the rest of their lives. We think about whether we have the proper experience for the species. There are some species we simply cannot accept at this time, such as snow leopards or Canadian lynx. North Carolina’s climate isn’t suitable for those animals. There are currently 21 tigers in our care, who were all rescued from a variety of backgrounds. Sadly, they won’t be the last to need us. We are proud to offer captive wild cats the peace and respect they deserve, but it’s unfortunate that they need us in the first place.